Line large cookie sheet with cooking parchment paper. Microwave frozen spinach as directed on box 3 to 4 minutes to thaw. Drain well; squeeze dry with paper towels. Set aside. In 6-quart Dutch oven, heat 3 quarts water to boiling; add 2 teaspoons salt. Meanwhile, in 12-inch nonstick skillet, melt butter over medium heat. Add shallots; cook 2 minutes, stirring occasionally. Add chicken; cook 3 minutes, stirring occasionally. Add pasta sauce; mix well. 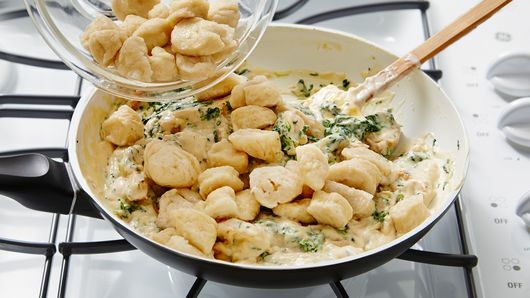 Reduce heat to low; cover and simmer, stirring occasionally, while preparing gnocchi. Remove dough from can; cut into 6 equal pieces. Roll each piece into 7-inch long rope. Using knife or kitchen scissors, cut each rope into 7 gnocchi. Arrange gnocchi in single layer on cookie sheet. 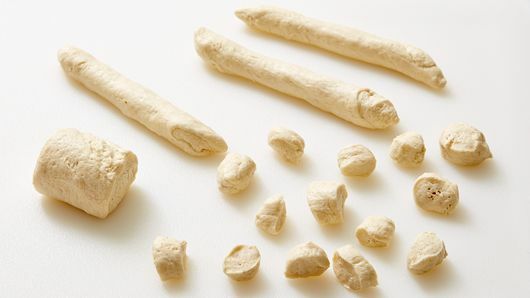 Add half of gnocchi to boiling water; cook about 2 minutes, turning once, until they float. Remove from water with slotted spoon to strainer. Repeat with remaining gnocchi. 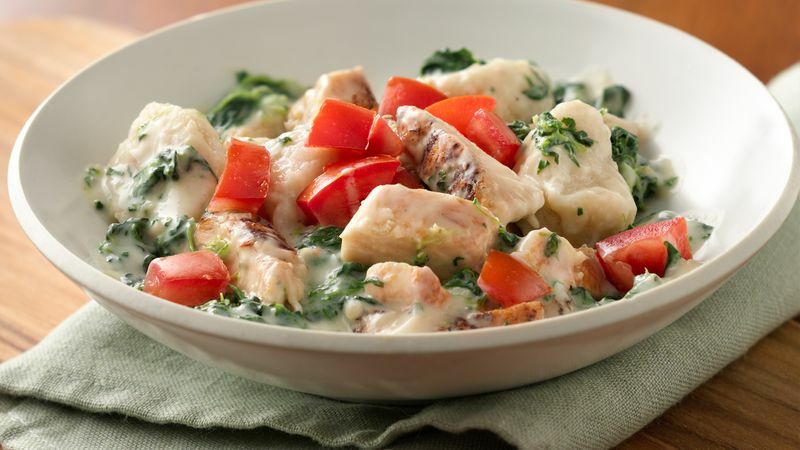 Add spinach to chicken mixture; mix well. Add gnocchi; gently stir until blended. Cover; simmer 5 minutes, stirring occasionally. To serve, spoon into 6 serving bowls; top with tomatoes.